You are here: Home » Culture » You are what you watch! You are what you eat…? At Alchemiya, we have been reading about Conscious Capitalism, an interesting concept that is highly relevant for our times; whether as a starting point or a destination, it is clear that we need to be thinking along these lines. Rampant capitalism is destroying us; we need to wake up and make some changes. One of the things that immediately jumped out was that John Mackay, the founder of Wholefoods, was one of the early architects of the Conscious Capital initiative. It is of course a natural fit. If you build a business empire based on encouraging people to eat clean, healthy, organic produce, it is only natural that you would, by extension, also be concerned with the overall health of the business environment. Healthy food, healthy people, healthy economy, healthy environment. Junk food, sick people, toxic economy, polluted earth. Wholefoods is just an example. The recognition of the need for health and wholeness has evolved from the 60’s fringe to your supermarket on Main Street, from hippy eccentricity to global mainstream. Food is perhaps the most obvious example. At Alchemiya, our concern is around another kind of consumption: what we watch. We spend more time watching TV than we do eating. 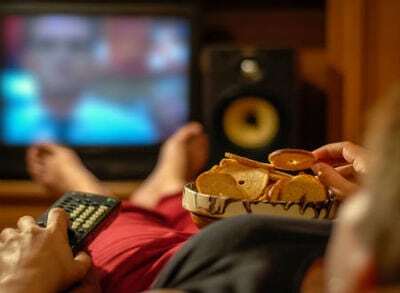 For huge numbers of us around the world, our viewing habits are the equivalent of bingeing on junk food. We do it without thinking a great deal, it is now a global habit. It’s been a hard day, put your feet up, watch a bit of telly. Even better, subscribe to a movie channel and watch wall-to-wall blockbusters. As with a junk food diet, your taste-buds will keep convincing you to just carry on regardless…regardless of the expanding waistline, shortness of breath, rising blood pressure, diabetes, heart problems, depression, anxiety, fear. When you make the link, it is of course obvious; but until that happens, it is just so easy to carry on…and to raise your kids along the same lines. Anything for a bit of peace, right? What we consume through our eyes, our ears and our consciousness has just as profound an effect as what we eat. Arguably even more so. We graze on the buffet of crime, violence, murder, sexual deviation, betrayal and revenge for the main course, and follow it up with soap operas, toilet humour, quizzes and reality TV for dessert. Why are we surprised when we see these same scenarios playing out in real life all around us? What we consume, we must either assimilate, or eliminate… or it will intoxicate. What we consume is processed into our lives; it becomes what we desire, what we believe, what we think and, all too often, what we then end up doing. And while there is an inevitable growing movement to be more mindful of how we live our lives, how we interact with each other and with our home, the earth, most media offerings still seem largely trapped in a downward spiral of appeasing our lower selves. We believe that it is time for a change. Not just a change, a paradigm shift, an alchemical transformation. This is at the core of why we created Alchemiya. We believe that if we offer people a wholesome diet of inspiring content, we will all, bit by bit, be changed by it. It will touch, move and inspire us, we will begin to get a taste for it, and to recognise the benefits in ourselves and our communities. It will change how we sit together as families, how we feel about letting our kids watch TV. It will change the “Hey, did you watch that thing last night?” conversation into something that elevates and inspires us. It is more critical than ever that we tackle these issues. Video consumption has gone digital, digital means mobile, mobile means that access to pretty much whatever you want is sitting in your pocket, just a click away. We cannot stop the purveyors of junk food from selling their wares. But we have to offer an alternative. At Alchemiya, we know we cannot do it all, and we cannot do it alone. But we have made a commitment to ourselves, and to the Universe, that we will source, acquire and create the best content we can find that tackles one of the pivotal issues of our time. Muslim life, how it is perceived and how it manifests. Close to 25% of the world’s population are members of the global Muslim community. 60% are under the age of 30. Around 40% are part of an emerging middle class who are likely to be highly influential in the coming decade. Their faith affects how they live, what they eat, how they save and spend, what they wear, where and how they travel…and what they watch. So this matters…now. A great Sage remarked, ‘If you truly embark on travel, you will arrive’. We are committed to a journey to become a catalyst for change; change of habit, change of perception, change of awareness, change of heart. We are going to give Peace a chance. It is about time, wouldn’t you agree? Disclosure: as well as being the founder of HalalFocus, Abdalhamid Evans is also the Chief Operating Officer at Alchemiya Media.